Microsoft wants you to buy, use, and presumably love Windows Phone, and it has already gone to considerable lengths and spent billions to persuade you to give it a try. The problem is, almost none of you are buying it. If the latest reports are correct, Microsoft is so desperate to get more people to buy Windows Phone that it’s pressuring hardware manufacturers to load it alongside Android. Supposedly, Microsoft executives are targeting HTC (an obvious choice, given its financial troubles), hoping it will load its popular Android handsets with Windows Phone, giving customers the option to use either. Yep … like the Chestburster from Alien, Microsoft wants Windows Phone to burst forth from the Android devices you buy. And the hope is, most assuredly, that it will kill the host. But what is the benefit to users? Dual-booting computers have never been popular, and anyone who has Android has already decided not to use Windows Phone. At most, this move will confuse new buyers, who may accidentally start using their phone in the wrong operating system. This is a scene from Dumb and Dumber, and it couldn’t be more relevant. Microsoft trying to shoehorn Windows Phone on to your phone relies on Lloyd’s kind of thinking. If you had a phone that could run both Android or Windows Phone, would you want to use a pretty but app-challenged OS, or an incredibly popular OS with better multitasking, more content, and every single app all your friends use, and then some? Normal, sensible people – even when faced with the choice on their phone – will choose Android, just like they have been every time they’ve upgraded their phone for the last few years. But one time in a million, they’ll tap the Windows Phone button. It’s truly bizarre logic. Windows Phone isn’t even selling when it’s installed on cool, dedicated hardware like the Lumia 925 or the HTC 8X. So now Microsoft wants to install it on Android phones on the off chance someone will try it and think, “you know what, this isn’t that bad”? You’ve got to feel for Microsoft, though. Celebrity endorsements haven’t worked; taxing every Android manufacturer hasn’t worked; its high-tech camera phones (see: Lumia 1020) aren’t selling; and the Nokia special partnership failed so badly that Microsoft had to buy out the struggling Finnish company. Hauling Windows Phone through the back door of every phone, like a Trojan horse, must seem like the only dirty option left. Sadly, it looks like a last ditch attempt to gain popularity after playing the game and failing. OK, maybe we’re being negative here. Maybe everyone will love having the option of swapping between two operating systems on their phones. So can it become a reality? Well, it almost did with the Ubuntu Edge, which promised both Ubuntu Touch and Android on the same device, but it failed to make its funding goals. Still, Canonical’s Edge was designed to be a super phone, one which could do everything you wanted, and Android’s inclusion would not only drive adoption, but make the phone more useful. Adding Windows Phone to Android, sadly, would almost do the opposite. It would just make a useful phone more confusing. HTC has also, indirectly, been a part of the dual-boot scene already, with its old HD2 smartphone. Clever fans worked out a way to triple-boot the phone, so it can run Windows Mobile 6.5, Windows Phone 7, and Android. It’s a genius piece of hackery, and proof that a modest phone can run multiple operating systems. However, it leads into the question of exactly who will care or want a phone that can dual boot Android and Windows Phone. Running two operating systems on a desktop computer is still a relatively geeky pastime, and the HD2 experiment proves doing so on a phone is doubly (or triply) as geeky, and a nightmare for sales people to promote in retail stores. Why bother? Just sell an HTC One instead – one with Android. Or offer an HTC One that runs Windows Phone. Why do we need a second OS taking up valuable onboard memory, just for the hell of it? If Samsung can’t make it work, can anyone else afford to try? Dual-booting on a phone is obviously possible, but it’s a pain. 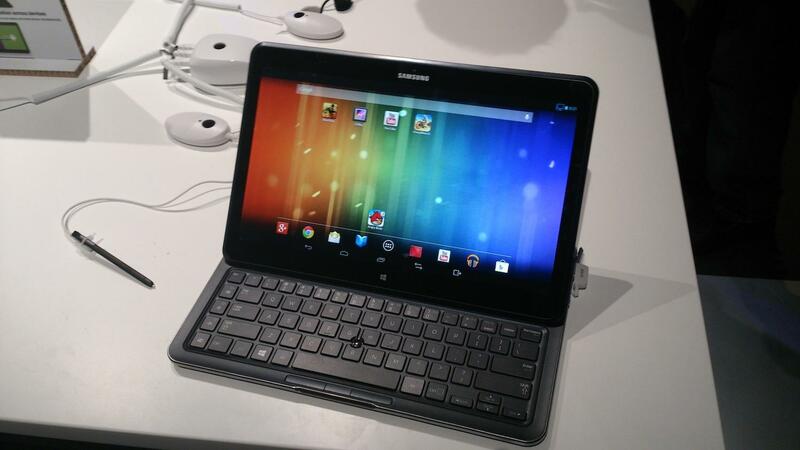 Samsung came out with the Ativ Q in June, a tablet which could boot and simultaneously run both Windows 8 and Android. It was an impressive machine, and there was an obvious benefit to regular users: Android is better for games and messing around, while Windows is ideal for working. However, since its unveiling, the Ativ Q has already hit problems. According to a report quoting Samsung, the device isn’t coming out this year at all. The reasons aren’t stated, but it’s very difficult to get two operating systems to play nicely, and that’s before you consider patent or licensing issues. Conspiracy theorists could even connect these two stories. Microsoft could be using the situation to pressure Samsung into producing a dual-boot Windows Phone/Android smartphone. Whatever it is, the first mainstream dual-booting device has had a difficult start in life, and it came from a manufacturer with considerable financial clout. I like Windows Phone. It’s a good-looking, enjoyable operating system. It has problems, but none of them would be solved by becoming so pushy. A move like this won’t turn Windows Phone into the unexpected hero, but it might make some of us think of it as the phone equivalent of Wormtongue, whispering in King Theoden’s ear in The Two Towers. Or, again, the Chestburster from Alien popping up to ruin dinner. Nobody wants something bursting out of their phone (or chest). Unless, of course, it tap dances across the table. We know it’s hard, Microsoft. The amount of money you’ve thrown at Windows Phone is great, but forcing yourself on us just isn’t the answer. Revise Windows Phone. Right now, as nice as it looks, there are a lot of reasons to choose Android or iPhone over Windows Phone, but few reasons to choose Windows Phone over Android and iPhone. The Lumia 1020 is the first Windows Phone we’ve seen with a solid reason to switch platforms (its 41-megapixel camera). Give us more reasons. Make WP superior to Android in every way possible. You’ll gain market share by being the absolute best – not like this.